Description: As heir to a kingdom of floating continents, Kali has spent her life bound by limits—by her duties as a member of the royal family; by a forced betrothal to the son of a nobleman; and by the edge of the only world she’s ever known—a small island hovering above a monster-ridden earth, long since uninhabited by humans. She is the Eternal Flame of Hope for what’s left of mankind, the wick and the wax burning in service for her people, and for their revered Phoenix, whose magic keeps them aloft. 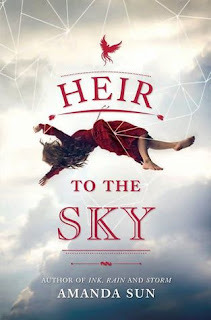 Heir to the Sky by Amanda Sun is her first release since The Paper Gods trilogy, and wow was it ever crafted beautifully. From the premise of the story to the way Amanda created the characters, it was just all really well done. I would give this book a 8.6 out of 10 rating due to some minor issues I had, but overall this standalone was really good. My favourite thing about this novel was the idea of these floating continents in the sky. This book had a creation story to stimulate how these parts of earth lifted and broke off from the ground. It was really unique to learn about and all the information provided was worded in a way that wasn't confusing for me as a reader. Another thing I really enjoyed was the way Kali described the way the empire or kingdom worked in reference to the phoenix. The descriptions for the monsters that are on ground level were magnificent. Each sounded terrifyingly beautiful. My one problem for this book would be a minor issue, but I still must mention it. I found the start to be quite slow. I obviously stuck with the novel because the actual premise was just so intriguing, but up until Kali falls off the floating continent my interested was peaked, but not at full level. Though everything from that point on was well paced and quite intriguing. Overall, the story and plot line was very well written and Amanda Sun did a really good job at executing all the important aspects of the story. The characters in this story had something very special about them. I loved learning about the Benu and their kind. I also really liked reading about the different society's these characters would function in. One monster hunter in particular stole my heart away and slayed it like any good monster hunter would. Griffin was amazing from the very first pages of him being introduced to the story. He had this certain charm to him that made him irresistible. I also REALLY liked finding out about his backstory. I had hunch about him, in the end it ended up being right, but I won't say too much. Though I will say that I really liked that twist involving him. I also really liked Kali, the main protagonist to the story. She had a nice strong will to her, as well as nicely executed mindset. the things she took joy in sounded like fun, and I liked that she wanted to get off the floating continent and experience the world below. All in all, these are just two of the characters I chose to highlight, but in reality each character brought something very unique to the story. Heir to the Sky is a standalone novel that was written in a way that I think would entice readers of all genres. I wish this could be a series in a way to read more about the characters and the struggles they would have to face, but at the same time I really liked that it was a standalone. It was really well done and I highly recommend this book! !